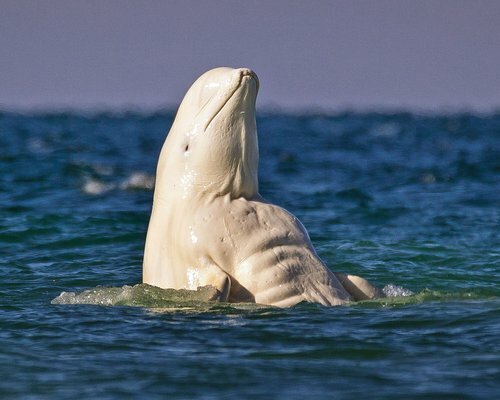 This Beluga Whale Has A Better Six Pack Than You! Swimsuit season is upon us, and while the majority of us might not be beach body ready someone else is. The hilarious photo of the mammal splashing about whilst seemingly flexing his pecs has us in stitches! It appears photographer, David Merron wasn't the only one to have noticed the whale's buff physique as it was quickly swarmed by a pack of females who were obviously impressed by his abs. David happened to spot the Beluga in the waters of the Cunningham River in Canada, and joked: "It looks like this whale has put in a lot of days at the gym!" Speaking of his love for whale watching he added: "I’d been watching whales every day for weeks, and I hadn’t notice any of the whales with particularly ripped bods – so I was fairly shocked. ‘When you think of a whale, covered in blubber, you don’t think of toned abdominals – especially the beluga whales, who spend their lives in the coldest of waters and have blubber 10-15cm thick to keep them warm." Well, these pictures make us want to head to the gym! PRONTO!